Teacher Protests In Arizona, Colorado Have Scores Of Schools Canceling Classes : The Two-Way Scores of schools have closed in the two states as educators demand pay bumps and boosted budgets. In Arizona, which has seen a massive walkout, tens of thousands are marching through Phoenix. The digital marquee outside Highland Arts Elementary School in Mesa, Ariz., seen at the start of class Wednesday, warns of the effects of the teacher walkout on Thursday. 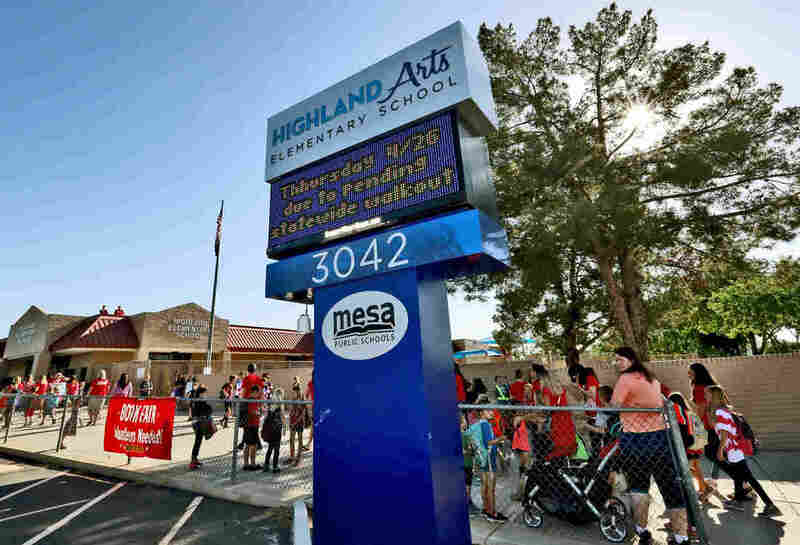 Educators across Arizona walked out of their classrooms Thursday with a series of demands in hand, foremost among them a raise and a return to the school funding levels of a decade ago. And many of those walking out have descended on downtown Phoenix, where they are marching from Chase Field to a rally outside the state Capitol. Organizers expected from 30,000 to 50,000 teachers and their supporters to attend. Meanwhile, scores of public school districts and charter schools closed for the day for lack of staff. According to an analysis by The Arizona Republic, more than 840,000 of 1.1 million students — or about 75 percent statewide — have been affected by the closures. "I think our students understand that we need a change and enough is enough," Noah Karvelis, a teacher and organizer of Arizona Educators United, said at a news conference Wednesday ahead of the rally. The grass-roots group is behind #RedforEd, the movement calling on teachers and their supporters to wear red in solidarity. "We simply can't take it any longer," Karvelis said. At the protest's heart are escalating frustrations with pay and financial support for schools — similar to those that have motivated teachers in several other states to walk out since a showdown in West Virginia ended with a salary bump for educators there. In Colorado, teachers are also mounting protests Thursday and Friday, which have already resulted in the closure of a handful of that state's large school districts. In Arizona, the AEU has announced five central demands — among which are 20 percent raises for teachers and certified staff in the next school year, smaller class sizes, and yearly bumps in pay until the state reaches the national average salary, which hovers at nearly $59,000 per year for public school teachers. Currently, Arizona's average stands at just over $47,000, according to the National Center for Education Statistics. The state's governor, Doug Ducey, has proposed a 20 percent pay raise for Arizona teachers by 2020, saying, "This raise is earned, and it is deserved." "To parents, I understand the pain and pressure caused by today's strike. I want you to know, I am working to get this 20 percent raise passed at the Legislature. But we need your help to make it a reality," he said in a statement Thursday, encouraging parents to contact their legislators over the matter. Yet the protesting teachers have already rejected this proposal, calling it unsustainable as it is currently drawn up. Teachers groups, including the Arizona Parent Teacher Association, argue that under the plan the raise would simply cause woes for others in the state's educational system. "I believe that the people are with us, and that provides the public pressure to get the governor to move," Arizona Education Association President Joe Thomas said Wednesday, according to the Republic newspaper. In this respect, an NPR/Ipsos Poll released Thursday appears to back him up. Nearly two-thirds of respondents approved of national teachers unions, and three-quarters said teachers have the right to strike. In Phoenix, meanwhile, the protesters plan to ensure their demands are heard Thursday — literally, in fact. The demonstrators are wrapping up their march outside the state's legislative buildings, where they are holding a rally right outside lawmakers' offices. Meanwhile, in Colorado, teachers gathered outside the state's Capitol in Denver, where thousands of demonstrators have kicked off two days of planned rallies. They are also pushing for more school funding — but an amendment to the Colorado Constitution some 25 years ago makes their fight a little different from others. The voter-approved amendment, known as the Taxpayer's Bill of Rights, "required that voters, not lawmakers, have the final say on tax increases, and it capped tax revenue," Jenny Brundin of Colorado Public Radio explained in 2016. "Anything the state raised over that cap — typically in boom years — would be refunded to taxpayers." So rather than aiming their protests directly at legislators, teachers are seeking the approval of a proposed 2018 ballot initiative that would raise taxes on corporations and the wealthy to increase funds for public education. They are also warily eyeing pension negotiations underway between state lawmakers, which may significantly alter the structure of state employee pensions. A similar alteration in Kentucky, which passed the state's Legislature in a surprise move last month, has prompted widespread protests in that state, as well. Schools in four Colorado counties closed Thursday, saying there would be too many teacher absences to properly provide classes. And Denver Public Schools, one of the state's biggest districts, has canceled Friday's classes, citing "the number of teachers planning to take the entire day off" and adding: "This is the case with most of our surrounding districts as well."